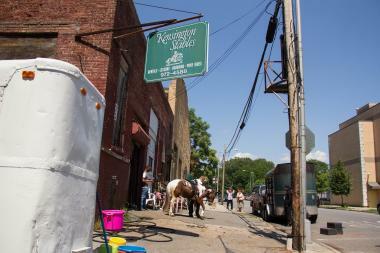 Kensington Stables offers horse trail rides and lessons in Prospect Park. KENSINGTON — The rides aren’t over yet. The owner of the long-running Kensington Stables has accepted an offer for the city to take control of the troubled riding facility near Prospect Park, the Parks Department and Councilman Brad Lander said. The Caton Avenue stable owned by the Blankinship family has been providing horse rides in the park since the 1930s, but recently ran into financial trouble and was nearing a bankruptcy auction. The city and Parks Department are hammering out the details of a contract of sale with the Blankinships, but have not arrived at a sale price yet, sources with knowledge of the negotiation have said. “This would be a great win for our community, and I'm very hopeful we can make it work,” he said. The Parks Department confirmed through a spokeswoman that the agency is “in talks to acquire the stables,” but declined to give more details. An attorney representing the Blankinship family did not return a request for comment. Currently, the stables operate trail rides through Prospect Park, riding lessons and pony rides at parties and events. As of February, the facility had about 30 horses and ponies, according to Walker Blankinship, whose family has operated the property since 1993, he told DNAinfo New York. "Everybody loves it," he said at the time. "But it's a hard business. It's like farming — you have very expensive land, very hard work, and a lot of regulations you have to follow." It’s unclear who or how the stables may be run under Parks Department control; neither Lander’s office or the Parks Department could answer questions about whether a third party would manage the horses or if the city itself would operate the stables.